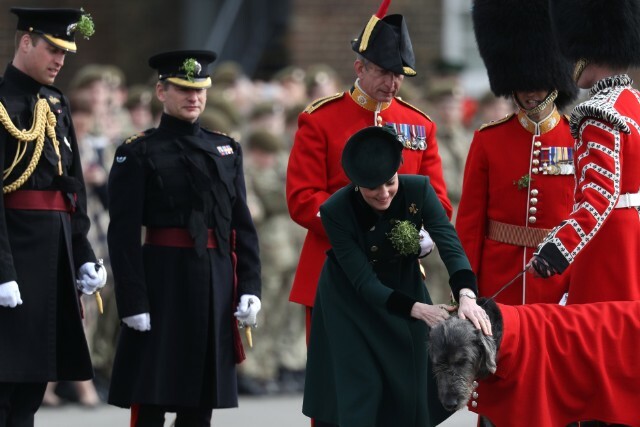 Today is a busy day for the Duke and Duchess of Cambridge…they are starting off with a visit to the Irish Guards to mark St. Patrick’s Day before heading to Pairs for 2 days crammed with events. I’m really glad that Catherine decided to attend this year, two years in a row would have been pretty much unforgivable I think… this event is such an easy morale booster there is no reason to miss it…EVER. Catherine wore a custom coat dress by Catherine Walker today. We’ve seen her hat before…she wore it Christmas morning 2015 but she has since had the point at the front of the hat rounded. Her Monica Vinader green onyx earrings that retail for $195 made another appearance as well. There were a couple new pieces today. There is a new bag we are on the hunt for and Kate was in a new pair of pumps that look very much like the Gianvito Rossi ‘Ellipsis’ style, but we’re still trying to firmly identify them. She also wore her Cartier watch today.